Editor’s Note: Today we present the second interview in our SHAD series. Dr. Daniel Weimer co-edited the newest issue of SHAD with Matt Pembleton and was, until recently, an associate professor of history at Wheeling Jesuit University. He is the author of Seeing Drugs: Modernization, Counterinsurgency, and U.S. Narcotics Control in the Third World, 1969–1976 (Kent State University Press, 2011) and “The Politics of Contamination: Herbicides, Drug Control, and Environmental Law” (Diplomatic History, Nov. 2017). His article is in the newest issue of the Social History of Alcohol and Drugs, published with the University of Chicago Press, and can be viewed in entirety (until May 1) here. I’m a historian of drugs and foreign relations, the main topics I’ve investigated for two decades now. For the past thirteen years I’ve taught at Wheeling Jesuit University, but the wave of higher ed. “disruption” has recently brought that to a close. However, I’ll continue to pursue history as an independent scholar, as there’s so much left to explore. What got you interested in drugs (and their history)? In grad school (Kent State University) I studied U.S. foreign relations and came at drug history from that angle while reading about the “G.I. heroin epidemic” during the Vietnam War. My adviser, Anne Heiss, suggested I contact Bill Walker about my interests. Bill was super supportive in helping me with my dissertation (and book, Seeing Drugs) that looked at modernization theory and drug policy during the 1970s. Interestingly—one of those quirky moments of synchronicity—when I was first working on my dissertation, I was using Bill’s book Drugs in the Western Hemisphere. Bill had dedicated the book to Richard Craig. I didn’t know Richard Craig, but across the hall from the history department was the political science department and I happened to notice the name “Richard Craig” on the faculty list posted on the wall. Well, I walked in and it was the same person. Bill’s work on Latin America and Richard’s work on 1970s Mexican drug policy led me to later focus on herbicides in drug control and to the larger issue of how environmental history and drug history overlap. Which gets to my SHAD piece on Afghanistan. Explain your journal article in a way that your bartender wouldn’t find boring. We hear a lot about opium and heroin production in Afghanistan and that despite the U.S. and others devoting a lot of resources to suppress opium cultivation and trafficking, the rate of production hasn’t budged. Why is that? There’s many reasons, but the economic realities of most poppy farmers’ lives and the environments (topography, climate, ecology) in which they live have long been powerful forces that the U.S. and international community can’t counteract. In short, Afghanistan sits in a poppy-friendly environment and creating other means of livelihood for opium producers, particularly in light of nearly four decades of political instability and violent conflict, is a monumental (if not) impossible task. And this is not something officials have only realized since the U.S. invasion in 2001, or even during the Soviet occupation and subsequent civil war of the 1980s and 1990s. U.S. and UN officials have recognized these challenges since before World War II. Is this part of a larger project? What else are you working on? As Matt mentioned, this special issue of SHAD is part of two-part project with related articles on drugs and foreign relations still in development (but hopefully on the near horizon). Since the last question in this interview is about dinner with scholars, I need to mention that this project all began at the 2015 SHAFR (Society for Historians of American Foreign Relations) Conference. It was then that Bill McAllister assembled the “cartel” for dinner—with myself, Matt, and Aileen, along with others, discussing our various projects. About a year later, Matt contacted me and since then we’ve worked on this project through various iterations and rosters. It’s very gratifying, then, to see the culmination of everyone’s work and I’m grateful to everyone for persisting and doing what they do. As for my own investigations, I’d like to keep with the drugs and environmental history theme. One idea I’ve been kicking around for a bit is seeing if there’s any connections between the volumes of drug-crop production data and the charting of climate change. Based on your research and experience, what do you see as the frontier or future of the field? I’ll first reference Matt’s statements about the need for a “global accounting” of the U.S. drug war and the integration of legal drugs (not just illicit) into foreign relations scholarship. But beyond that (and the other topics we mention in our introduction), I see the continuing de-centering of the U.S. as the only/main driver of global drug control as an important thread in drug history. Also, the demand/treatment side of drug history and the lived experiences of users and drug-trafficking workers are two other areas in need of investigation. What scholar, living or dead, would you most like to have dinner with? I’m convinced Emma Goldman and Michael Taussig would make for great dinner companions. Editor’s Note: Today, and for the next few weeks, we’re excited to present interviews with the authors of the first issue of the Social History of Alcohol and Drugs to be published with the University of Chicago Press. Even better, the articles are all available to read for free until May 1. Today we talk with contributing editor Dr. Matthew R. Pembleton, who served as guest co-editor of this issue with Daniel Weimer (more from him on Thursday!). You can read their editors’ note here. We hope you enjoy these interviews, and we also hope you’ll consider subscribing to the journal to read all the great ADHS scholarship to come! I’m an adjunct lecturer at American University, where I finished my PhD in 2014. I’m also a Fellow at DC Policy Center and a consultant at the National Academies of Sciences, Engineering, and Medicine, where I’m working on a project about the 150 year+ history of the Academy complex. I’ve been in the DC region for most of my life, which I guess make me a swamp creature–just not one of the well compensated ones. I actually came to the history of drugs from the angle of enforcement and control (womp womp) as a grad student. I was (and am) particularly interested in the dilemmas that accompanied foreign drug enforcement and the overlap with national security, in terms of both operations and ideology. That was basically the initial impulse that resulted in my first book, Containing Addiction: The Federal Bureau of Narcotics and the Origins of America’s Global Drug War (UMass, 2017) – which just won a prize and is available at fine retailers now! As I started to dig into the misadventures of American drug cops poking around in places like post-WWII Turkey and Italy, I realized that US counternarcotic strategy was premised on a particular theory of drugs and if I wanted to understand how the US government saw drugs, I had to understand the history of addiction. So I kind of started from US foreign policy and the US in the world and backed into the history of addiction, science and medicine, and public health etc. And as I started to examine the question of why some drugs are policed but others are not, I feel like that’s when my scholarship really began to open up. At one point in this journey, one of my advisors explained how grad students and early career academics are associated with their dissertation topics and what historical subject that do, and he warned me that I would be known as a historian who does drugs. He was very pleased with himself at the time. And to which I would now reply: we are all of us drug users of one kind or another, which is part of what makes this field so interesting and useful. Because many drug products are global (or at least regional) commodities, there’s a fundamental foreign relations component to the history of drugs. And because the United States has long been one of the most prolific consumers of drugs–both legal and illegal–as well as the most active proponent of global control, the US has a special role in this history. Over the last few years, there’s been a lot of great work on drugs as an element of US foreign policy as well as those international and global dimensions of drug history. So the project, which I edited with my colleague Dan Weimer, features some of the most interesting and promising scholarship on the intersection of these two subjects. In the volume we cover US colonial drug control in the Philippines, the national security dimensions of the Marihuana Tax Act, the way drug enforcement tends to overlap with counterinsurgency in places like Mexico, the mutual impact of failed 70s-era decriminalization debates in Colombia and the US, and the environmental and ecological challenges of drug control in Afghanistan. Indeed it is. This first half features more in-depth archive driven case studies. There’s a second half that’s more about theory, methods, and historiography making its way through the review process. So stay tuned for more. Meanwhile, I’ve got a couple of new projects of my own in development… (he answered cryptically). We actually address this directly at the end of the intro, because this was one of the elements that Dan and I were really interested in when we first set out on this project a few years ago. I’ll point out two areas for now. The other major frontier, as Dan and I see it, is something that ADHS has been actually working on for a while which is the historically contingent line between legal and illegal drugs, and we were really interested in pushing beyond the legal category of “narcotics” or Schedule 1 controlled substances as an element of US foreign policy. We kind of struggled with that, because US foreign policy is primarily interested in illegal drugs. But I’m encouraged by recent books like Nan Enstad’s Cigarettes, Inc (U Chicago, 2018) and think that would be a fruitful direction for scholarship on drugs as an element of US foreign policy. What will a global history of the opioid epidemic look like and what influence does Big Pharma have on the role of the US in the world? BONUS QUESTION: What scholar, living or dead, would you most like to have dinner with? My humor can run kinda dark so it would be fun to sit down with Ambrose Bierce and H.L. Mencken and bemoan the state of the world. It would interesting to try to explain Trump to two of the greatest and most cutting satirists in American history, though I’d almost certainly be horrified by Menken’s racism and wouldn’t want to plan any research trips with Bierce. In January 2018, Nancy Campbell, David Herzberg, and Lucas Richert assumed responsibility for Social History of Drugs and Alcohol: An Interdisciplinary Journal. They took on the role of co-editors in chief and began planning for the future. In April, the ADHS signed an agreement with University of Chicago Press. 1.) Tell us about your history as a scholar. What got you interested in alcohol and drug history? Nancy: As the daughter and grand-daughter of small-town doctors, I was fascinated by the drug room and amassed a large collection of pharmaceutical giveaways. I was struck by how dismissive people were toward “druggies,” so at a tender age, I announced my intention to write a history of drugs. I’m just sticking to the plan. Luc: I didn’t have a plan. Far from it. But I did figure out that I wanted to focus on the field of history in my third year of undergraduate. I started scheming and scrambling after I finished up at the University of Saskatchewan – and then I traveled to Edinburgh and London for graduate school. Early on, the American pharmaceutical policy grabbed my attention for a number of reasons; ultimately, this seemed a useful way of understanding the Reagan administration in the 1980s. David: One of my closest friends in college had a very severe anxiety disorder. He was a very charismatic guy and liked to hold court and hold forth while medicating himself thoroughly with the one drug that he said eased his mind, alcohol. A favorite subject of his was Big Pharma medical journal ads. He had somehow come into possession of a huge stack of old journals, and he would flip through the images of smilingly healed people, deconstructing them freestyle, brilliantly but also bitterly–those drugs had let him down, but there they still were, mocking him with their shiny and, to him, fake promises. It stuck with me, this acute, intense version of consumer culture promises and human realities. My friend died while I was in grad school, making the questions more urgent right around when it was time to pick a dissertation topic. EDITOR’S NOTE: Points is delighted to welcome Stephen Siff, an associate professor in the Department of Media, Journalism and Film at Miami University of Ohio. 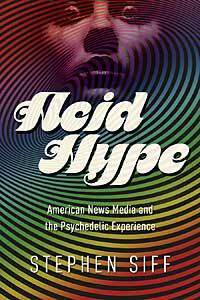 Below, Siff discusses his recent book, Acid Hype: American News Media and the Psychedelic Experience (University of Illinois, 2015), which chronicles LSD’s trip from multi-colored miracle to mind-melting menace. Acid Hype is a history of how newspapers, magazines and TV reported on LSD and similar drugs in the1950s and 1960s. During that time, mainstream media enthusiastically promoted LSD as a treatment for all sorts of problems, and talked about its potential to provide memorable experiences to people who were not sick. The book explains why journalists working for major newspapers and organizations like Time and Life devoted so much attention to describing psychedelic drug experiences, and how such work evolved as a genre within the journalism of the period. Acid Hype leaves off around 1970. That’s when the media lost interest in psychedelic drugs, even while their actual prevalence in society was continuing to increase.